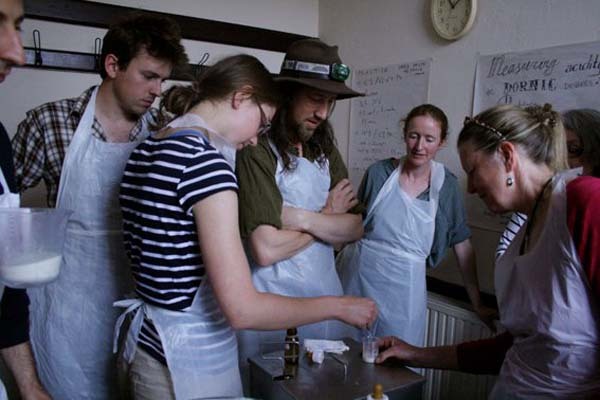 The design of a kind of cheese, and the operation of a Cheese Production Mobile Unit (CPMU), also named Mobile Dairy School, is a project developed at Grizedale Arts, as on-going process relating aspects of food, culture, territory , identity and taste. 3.- Building of Portable CPMU and extension of co-production social system. The project takes as its starting point John Ruskin;s initiative of a Migratory Dairy School for local farmers, providing them with the necessary skills to diversify their outcome, increasing income from their produce. Other influences include the Krausist Movement in Spain, that crystallized in 1876 in the Free Institution of Education (ILE). One of the most interesting projects of the ILE was the Mobile Museum, was a migratory collection of copied paintings of masterpieces, travelling from village to village. Another aspect of their work, like Ruskin, was the promotion of Dairy Schools in rural areas, specially in Northern Spain. As an important dairy farming community, being given the skills to transform milk into butter and cheese, provided advise, accessible technologies, training and hygienic measures, this was seen as a way to improve farmer´s incomes. The project also takes from previous work, where a Shepherd´s School was initiated in 2004 which is still ongoing. It was in that project that the prototype 1 of CMPU was built and tested. During 2011 a CMPU 2 was also designed and built in Berlin to produce cheese and run workshop under the project Vorratskämmer with Myvillages, shown in Haus der Kulturen der Welte at the ULK show. The Mobile Dairy School was intended to be not only geographically mobile but also socially mobile, being pitched at different sectors of society and cultural backgrounds. Fernando led these workshops, from farmers to life-stylers and artists. The utensils used for cheese making during the workshop came from the first prototypes designed and built for the Shepherds School Fernando runs annually. Three tanks were set up, allowing the attendants to split in smaller groups and take an active role during the whole process of cheese making. The milk (400 litres in total) came from the local dairy farm, Seizer Barn. The kind of cheese produced during the practical part of the workshop was mainly a self-pressed enzymatic hard cheese, of long ripening. Ricotta was also produced from the resulting whey. 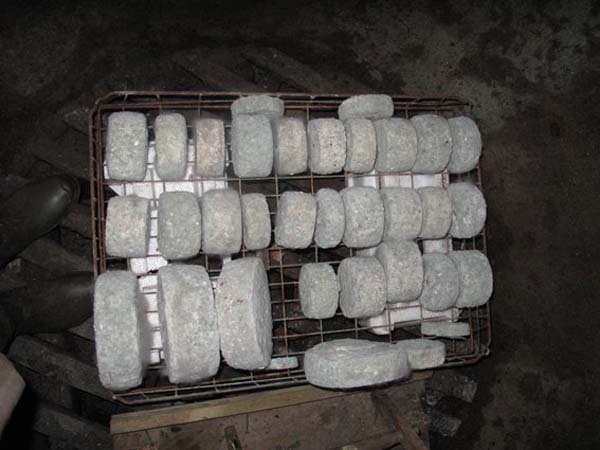 The total cheese production was of around 38 kg. Brantwood, Ruskin´s former home, had offered Ruskin's Ice House for the cheese storage. The Ice House, a luxury in Victorian times, designed to store ice for the whole year, sometimes imported from Norway, was one of the many projects Ruskin carried out without a very succesfull result. Thanks to Brantwood staff members and specially Sally Beamish, temperature and humitity where recorded, defining a constant 6.5 ºC temperature and 100%rH humidity, which is quite appropriate for cheese storage. All the cheese was stored in the Ice House for ripening for around 3 months, with some maintenance of turning, brushing and oiling every week or fortnight. The third workshop took place over two days. 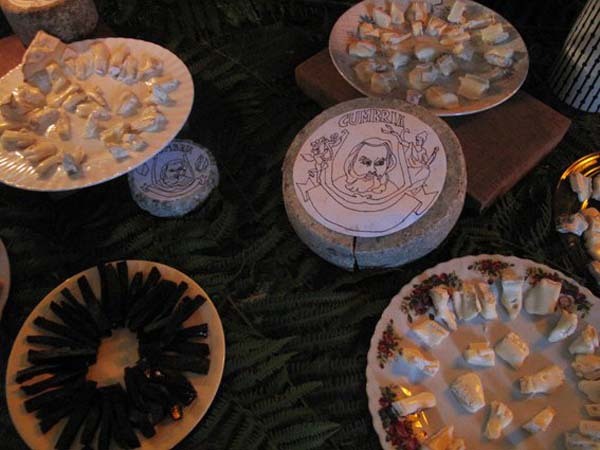 The first event was an evening of tasting the Workshops cheese after three months of being stored in Ruskin’s Ice House. The tasting took place in Consiton Institute and was accompanied by a selection of other local cheeses and matching wines selected by Adam Sutherland. Atendees were encouraged to think up a name for the newly developed cheese but a final decision on a name is yet to be made. 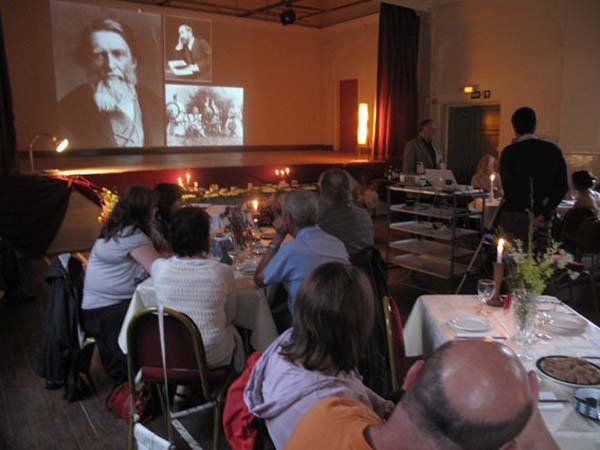 The evening also included a lecture given by prof. Ivan Day, a renowned British food historians. The talk focussed on the history of gastronomy as a cultural manifestation, and, more specifically, an insight into milk derivates and the history of cheese; its evolution from casual fermentation to the sophisticated and diverse food that we have come to value today. The next event was a "philosophical cheese workshop", bringing together different cultural perspectives, from artists, historians, curators and art critics, to discuss ideas related to the cultural aspects around food production - the relevance of place and culture - and the relation that artists can build with their practice with it. This conversation focussed on the ever changing attitudes towards food, community and tradition. This second stage of the project is a more solitary work of the artist, fed in by the previous stage, and all the collaborative efforts carried by the participating groups. 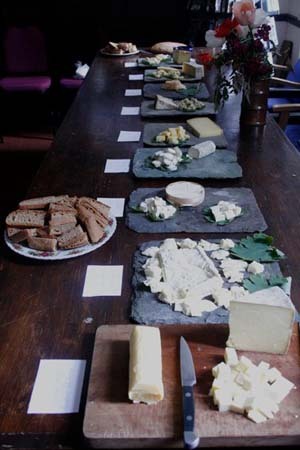 At the end of the three workshops described before, a tasting of assorted british, french, and spanish cheese was organised. The kind of cheese where selected together with local cheesemaker and cheesemonger Martin Gott. The aim was to have a diverse range of kinds of cheese, from goat milk soft acid cheese to hard cooked cow milk cheese, and blue ones. The cheese tasting was directed by Fernando Garcia-Dory, and participants were provided with evaluation forms in which they scored the different aspects of each cheese, from shape to taste, aroma, flavour and texture. The forms therefore reflected preferred features for cheese by each taster. All those forms, filled by each different social group gathered in each workshop, where compiled and processed with certain algorithmic software thanks to the collaborations of artists Robin Kirkham and Harry Blackett. The resulting data provide the average selection of the most desired traits of a cheese. This information will be later translated by the artist which will lead to the final designo f a cheese, tailored to the Cumbrian palette. The third stage of the project will involve making freely available the information on how to produce this new local cheese as well as providing access to the Cheese Production Mobile Unit that would allow dairy farmers in the area to experiment and maybe open new diversification possibilities in farm economy. That CPMU is not ony a carrier of the diverse utensils needed for cheese making, but when compressed, its also a clasroom, a piece of furniture, a biotech lab, an stable and milking unit, a museum, a market stall , a temporary art room, and an (edible)-propaganda kiosk. It will have a tank of 25 l. enough for a small production, at family farm scale. It will combine stainless steel with a shell in molded plastic. For this plastic material, research is being done to use Galalith as milk-based plastic. Galalith ( also known as Erinoid in UK) was one of the first synthetic materials, alongside bakelite and celluloid. It was invented in 1889 by A. Spitteler and W. Kirsche from milk casein. At the beginning of the 20th century, a French chemist, Monsieur Trilat, discovered the means to insolubilise casein by immersion in formaldehyde. Known under the trade name of galalith, this material revolutionised the button industry with its capacity to create structural effects and imitate all sorts of material - horn, tortoiseshell, ivory, wood, etc. It was also used in the thirties for jewellery, pens, umbrella handles, etc. World production at that time reached 10.000 tons. One of its great qualities is its porosity, making it ideal for dying, by immersing white galalith in coloured bath. Therefore the device for milk transformation and cheese making is made itself from milk. Once the CPMU is built, a group of roughly 6 local farmers and people interested in producing cheese at a small scale, will be gathered to explain its use and organise the collective. There is the possibility to acquire as a group a small flock of goats of around 30 or 40 heads. This flock will not only produce some milk for cheese making but also help conserving pastures and open land. A mobile electric fence will be transported with the flock and the CMPU from farm to farm, to stay around 2 months in each farm, before going to the next. This collective system allows farmers to have free time from the demands of a milking flock. 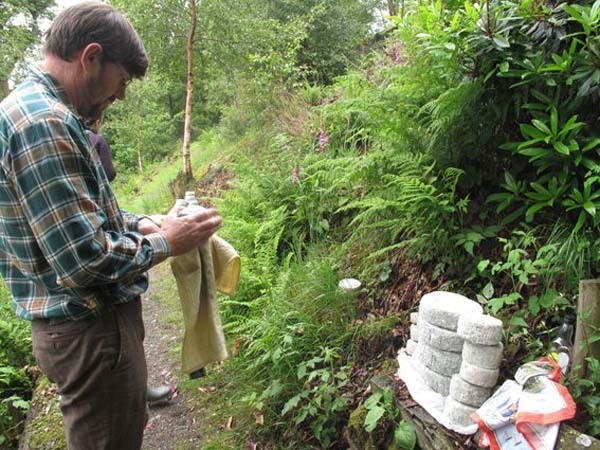 Grizedale Art will be part of this users and temporary nomadic cheesemakers community.